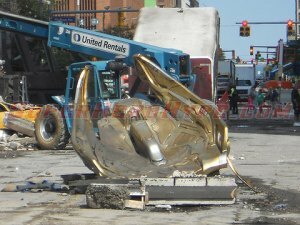 CLEVELAND, OHIO (HNN) - Pittsburgh has the Dark Knight, but Marvel has selected Cleveland, Ohio for the Avengers shoot. Actually, they have so much of this secretively under way, few images have escaped. But, here are a few glimpses. This piece captures Downtown Cleveland's Euclid on E. 9th where on August 16 a scene went before the cameras. The Avengers starring Robert Downey Jr. as Iron Man, Jeremy Renner as Hawkeye, Scarlett Johansson as Black Widow, Chris Evans as Captain America, Chris Hemsworth as Thor, Mark Ruffalo as The Incredible Hulk and Samuel L. Jackson as Nick Fury. In Theatres May 4, 2012.